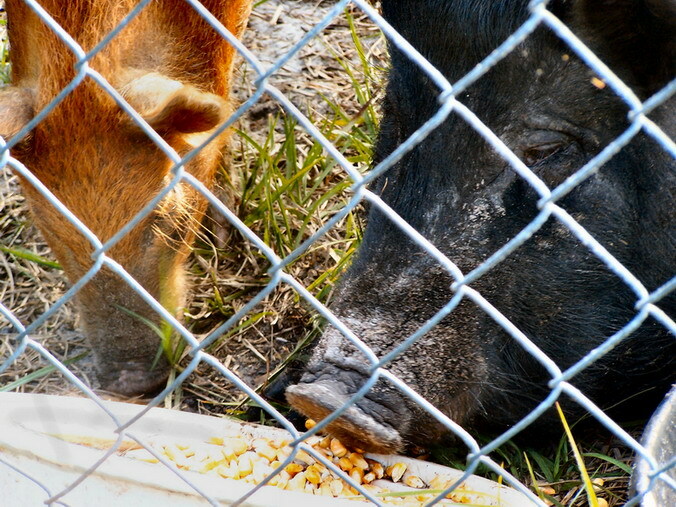 Pigs Snuffle, but Dammit, They Bite, Too! When I started this blog I had aspirations of keeping this up regularly and to write about topics of import. Then, I started sitting down to look at blank screens, blank screens I had no idea how to fill. I don’t claim to be a genius. I don’t claim to know more about everything which could be used for a topic. The only topics I know about are the topics which touch my life…such that it is. I say “such that it is” because my world has become so very small by the standards of, well, most people. My laptop is my gateway to the world…cyber world…a vicarious form of living, at best. I must admit to having more ‘friends’ online than I do in the real world. Oddly, I feel a certain amount of safety in this situation, but it’s so very lonely, too. I’m a touch person. I’m a hugger. I’m a holder. Voices are important to me, too. Words on a screen can be so very, very misunderstood without the emotional/personal cues always present in the human voice, the human face. Voices are comforting when the meanings of the words are clear from the cues when the written words may come across in another way entirely. Really. How many times have you found yourself wondering what someone really meant by something they typed? Or have you found yourself in a tiff with someone only to discover that you’d completely misread what they’d said to you? Maybe you’ve found yourself desperately trying to remove your foot from your mouth because someone else has misunderstood words kindly meant by you? I’m guessing you’re wondering by now what any of the previous has to do with snuffling pigs who also bite. Quite honestly, it’s my new world. Trying to have a small farm in my backyard is a helluva lot harder than I had envisioned. Some friends of mine, folks I’ve actually hugged quite a few times, make it look easy. On the other hand, they’ve had a tad more practice, and I’ve taken things somewhat further in the farm direction. My three turkeys have procreated (no clue which the father is), and I now have 14 little, two week old, darlings who can already fly driving us mad trying to keep track of them all. Still with me and wondering about the pig? 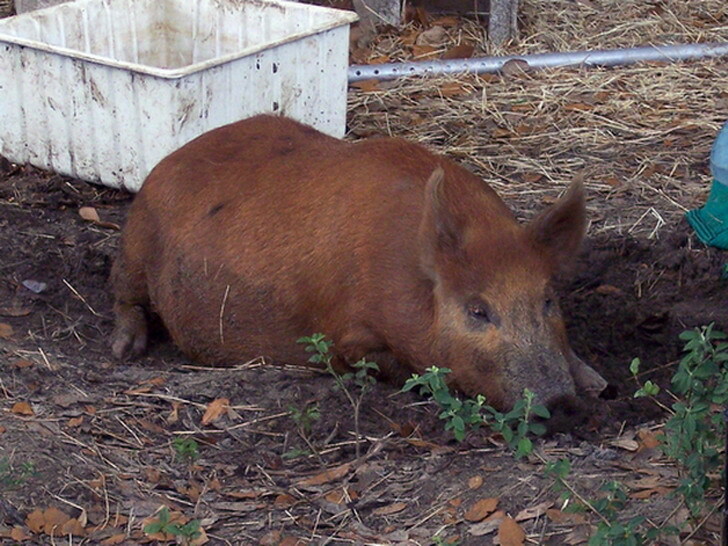 Well…that started a few months ago with a big, black sow I started calling Petunia. Mom and I were grazing the goats when she just came wandering up and began hanging around. She looked like a pot belly that had maybe been dumped or escaped. It took a little doing, and a whole lot of whole corn, but eventually she allowed us to start petting her. Then she disappeared, and I was heart broken. I’d heard some folks across the canal from us set their dogs on a pig, and I just knew it was my sweet Petunia. For days, I called them everything except people. 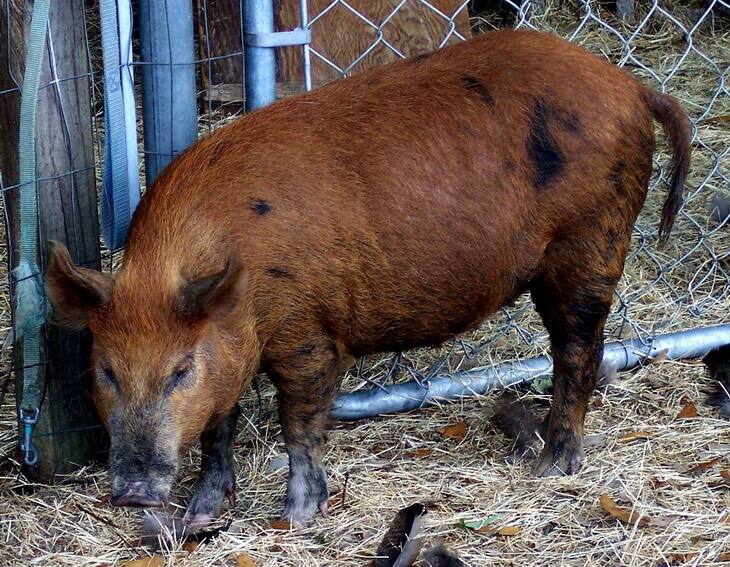 A couple of weeks later, she showed back up with a small, copper colored piggy with black spots in tow. Around here, the mixture of color with the black spots indicates a domesticated hog got loose and found it’s way into a family of wild pigs. 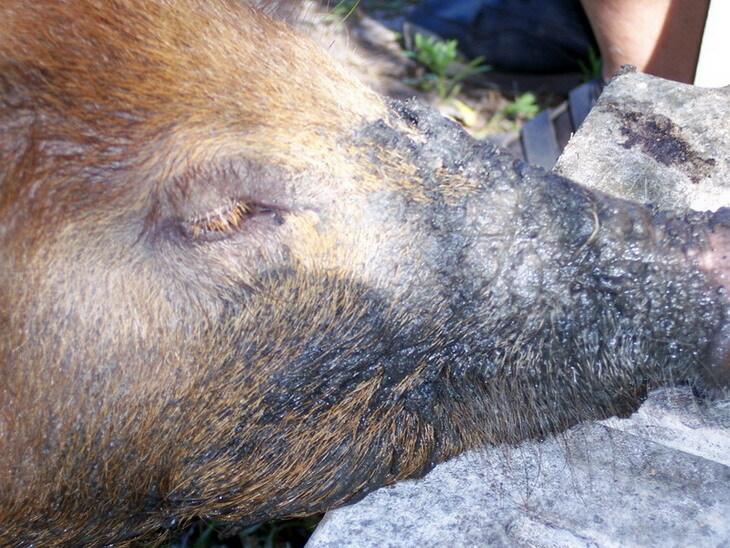 Those inter-breedings can lead to some very colorful wild pigs. 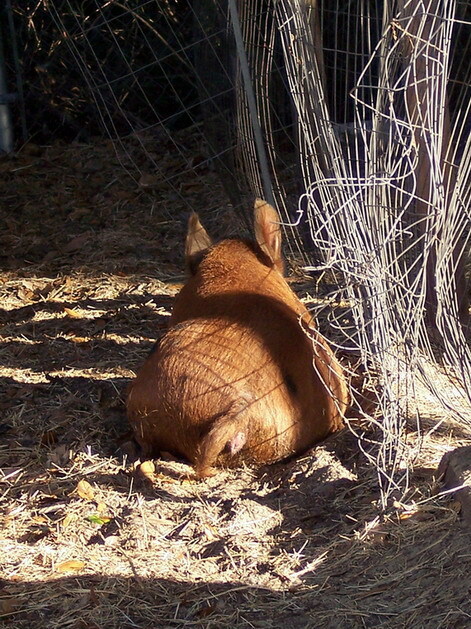 This is back when Daisy was still named Bacon, and she had just started hanging out with Petunia. Anyway, the little one was named Bacon because that was to be her destiny. Her destiny changed. One afternoon after they’d wandered off, we heard some shooting. The next morning, Bacon showed up absolutely frantic. She dashed everywhere she and Petunia tended to frequent when they visited us. It didn’t take a whole lot to figure out that Petunia really was gone this time. As things would happen, we didn’t call her Bacon for long. Dad wasn’t a happy camper at all when her name got changed. He looked at me, but Mom explained it to him this way, “It’s personal now. We can’t eat her.” Daisy has turned out to be such a sweet girl, except when she’s aggravated, that’s when she goes from snuffling to biting, and she gets aggravated when you tell her “No!” (of which she very well knows the meaning), when you’re late with one of her meals or you touch her more times than she’s currently willing to allow. Of course, I push my luck everyday. Other than that, she’s training me quite well. She's not sure about the camera, so her little tail isn't curled up the way it is usually. Ain't she purty? This is Daisy in her little mud hole. The bit of green cloth to the right of her in the pic is the corner of a much larger piece she likes to be mean to when she can't tug my pants or untie my shoe laces. As I write this, she’s currently sleeping under the front porch. I fully expect her training of me to continue first thing in the morning. Despite her being pig and me being person, I’ve come to truly enjoy my time with her (except, of course, when she bites). It’s peaceful and often it’s fun. When she’s feeling really good, she runs around literally kicking up her heels and having a high ol’ time. When she seems to be down, we just sit there, me in my chair and her in her mud hole. It’s nice. No pressure. No judgement, and if it weren’t for the damn invasion of traffic sounds from the interstate, we’d be completely in our own little world unaware of the big, sucky world around us. Except that her sucky world starts when she leaves our property. It’s not safe for her and fortunately she knows it. I’m afraid of the day she forgets. Then, I’ll lose her, too. I sure miss Petunia. I blame myself for what happened to her. I’m the one who started feeding her, and I’m the one who was working with her for the intimacy of touching. In my mind, if it weren’t for me, she’d not have let her guard down to be killed. I know I seem to repeating those mistakes with Daisy, but I’m trying very hard to make her happy enough not to leave, except maybe to find herself a local boyfriend, and come right straight home where it’s safe. Addendum: She was in fine form this morning! Her breakfast was late…. I was very late getting up this morning, and thus very late feeding Daisy. This was the view I received this morning, and I assure you, it came with lots of attitude! There’s been progress in my relationship with Daisy. Mom took her and the goats out to the field for grazing. Since the goats didn’t want to play with Daisy, she decided to hang out with Mom…who then decided to see if she liked to crunch ice cubes. As it would happen, she did! She also decided to let me pet her! Yay! Unfortunately, the vid of the event didn’t work out. I’ll try again soon, but a few pics did turn out. I tend to be broody, but my animals make me happy. I've never known how to fit in with the crowd, and now, at 53, I don't bother to try. I once was "in" for awhile, and I found out they're mostly a miserable lot. I'd rather sit under a tree and read a book...a real book, not a pad or computer! This entry was posted in Nature, Stuff, Thoughts, Uncategorized. Bookmark the permalink. 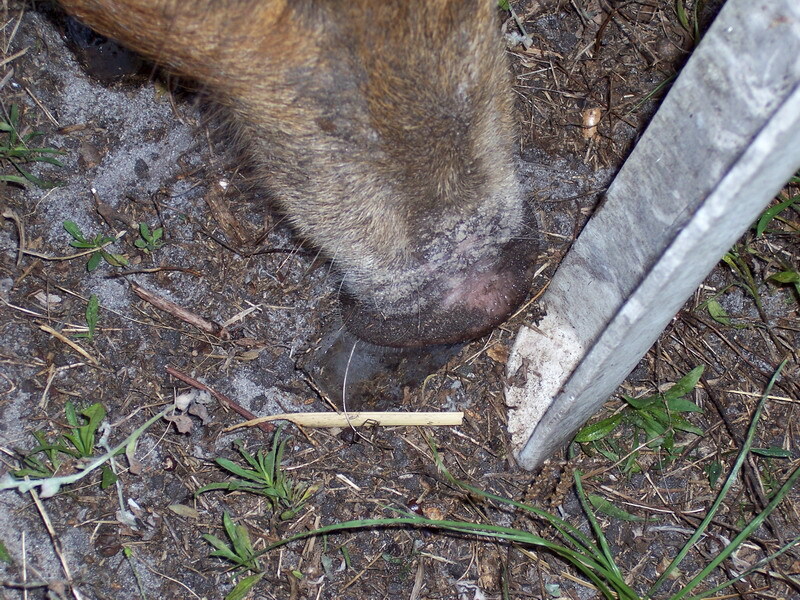 1 Response to Pigs Snuffle, but Dammit, They Bite, Too!